From left, Capt. Jules Chan (B.B.A. ’08), his mother Vanessa (M.A. ’98), father Julius and younger brother Jed Chan (B.A. ’15). When Vanessa Chan (M.A. ’98) was a young mother and graduate student at St. Mary’s University in the 1990s, she often had to bring along her fourth grader and preschooler to study groups in the Blume Library. It wasn’t ideal, but as a military spouse working full time while trying to complete her clinical psychology degree, Vanessa didn’t always have a choice. All of that library time must have rubbed off. Many years and countless military moves later, both of those young boys are now graduates of St. Mary’s. And like their father, Julius Chan, who retired as a sergeant major after 22 years in the Army, they too felt called to military service. Chan’s oldest son Jules (B.B.A. ’08) is an Army captain and has already served two tours in Afghanistan. 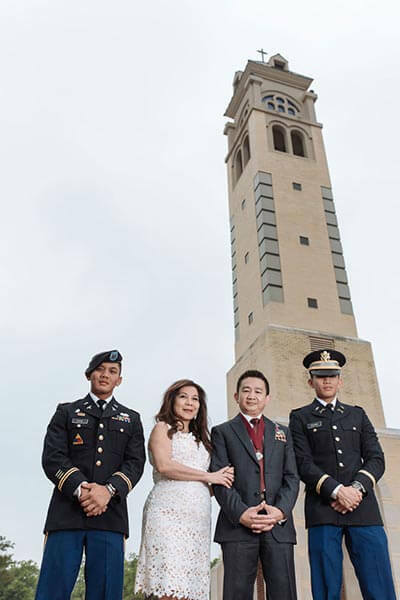 He is currently a company commander at Fort Bliss in El Paso, but was able to leave post to attend his younger brother Jed’s commencement and commissioning in May. And once Jed is done with officer training, he will join his brother at Fort Bliss. Even the commissioning ceremony was a family affair for the Chan clan. As Jed was taking his oath as an officer, brother Jules performed the swearing in, and their father Julius rendered Jed’s first salute. It was a poignant moment for Vanessa. “I feel a deep sense of pride that my husband and sons have chosen careers that keep our country safe and strong. The career they chose is a difficult but honorable one,” she said.